At least one person is definitely not jumping on the bitcoin bandwagon. In particular, he noted that the value of bitcoin today is derived from the “expectation of what it will be tomorrow.” This unpredictability, combined with the possibility that government could “clamp down” on it at any moment, led Stiglitz to argue that bitcoin could collapse. His prediction has already showed signs of truth, as bitcoin plunged 20% just hours after breaking its all-time record on Wednesday. 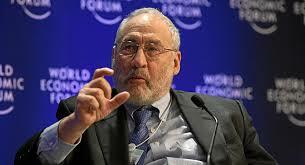 Stiglitz received the Nobel Prize in Economics in 2001 for his analysis of markets with asymmetric information. Your goal as an investor should simply be to purchase, at a rational price, a part interest in an easily-understandable business whose earnings are virtually certain to be materially higher five, ten and twenty years from now.